The Best Fitness Power Rack scored high marks in all areas and is our top pick. 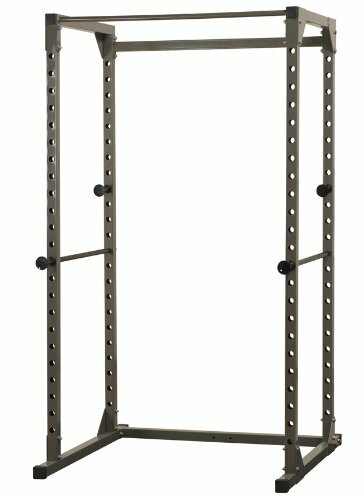 This steel power rack is perfect for those wanting to set up a home gym with high quality equipment. The double gusseted uprights are durable and sturdy and provide stability during your workouts. The powder coated finish on the steel is scratch resistant and the ends are capped to prevent internal oxidation. This is the perfect rack for doing a multitude of exercises. A power rack is an important piece of equipment that acts as a “spotter” when you are working out with free weights. Its purpose is to help you work out safely. Power racks are also sometimes called power cages or squat racks. There are many different manufacturers of power racks and many different quality levels available to choose from. There are simple racks that have little to no features and upgraded models that have tons of features. Choosing the right power rack for your needs can be a challenge if you are not sure what to look for. We spent over 45 hours researching and testing 15 different kinds of power racks and found that stability, weight capacity, and ease of set up were most important. The purpose of this buyer’s guide is to introduce you to some of the different styles of power racks available so you can see what exists on the market. We will point out some considerations that you will want to think about when researching which will help you choose the power rack that provides everything you want. 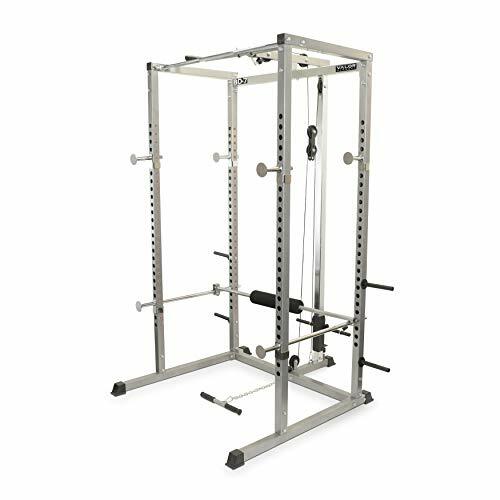 Quality and value come together to join with function in this power rack from Best Fitness. The mainframe of this unit is made from 14-gauge, 2 x 2 steel. It has two adjustable lift offs and safety bars that are full length. The 500-pound capacity of this unit can hold all the weight you need. This power rack offers lifters 23 different lift off positions so you can perform a number of exercises. The steel frame is coated with a durable powder finish to prevent scratches while you are loading bars and using the rack. The price is excellent too. Whether you are outfitting a home gym or looking for power racks for a commercial gym, this is an excellent choice. You will be able to take your workouts to the next level with this Soozier Adjustable Power Rack. It is made from heavy duty steel pipe that provides plenty of stability and durability. The adjustable barbell rack works for a variety of starting points making it perfect for several different exercises. Use this power rack as a rack for your barbell or use it as a means of doing body weight exercises such as pull-ups and leg raises. The wide space on the side allows plenty of room to do side to side movements. The dimensions are 49 ½” L x 45 W x 84.3” H which is plenty tall enough to handle many different exercises at different heights. CAP is a well-known name in fitness equipment that has earned their respect from consumers by providing quality products and excellent customer service. This steel power rack is just what you need for your home gym to help with many different weight lifting exercises that would be easier with a spotter. The rack’s uprights have been double-gusseted so they are stable and durable while you are working out. The steel has been coated with a 3-step powder finish that makes it scratch resistant so the finish doesn’t get nicked or dented when you move the bar or store it after your workout. The frame ends on this power rack are capped so there is no inner oxidation going on. This power rack, which has bar catches, is the perfect assistant to doing dead lifts, curls, squats and more. The overhead workout bar has been reinforced for those who want to do body weight training such as chin ups and leg raises. There is a convenient space on the back of the power rack for placing your plates and bars when you are done with your workout. Power racks are found in almost every gym because of the value and safety they add to workouts. Now you can get that same safety and performance in your own home and purchase one to add to your existing equipment. Power racks are not complicated pieces of equipment but they offer a lot of value in terms of having that extra mechanical spotter on hand to help when you are performing tricky exercises in your own home. There are many different types of power racks on the market. They are all similar in design and function with the exception of the additional features on certain models. You must know what goals you are trying to achieve before being able to be assured that you can choose the right power rack for your specific preferences. Read the buyer’s guide below to learn more about power racks and how to choose the best one. This information will show you what you need to consider when comparing different models and how to sort through the available racks to determine which will meet your needs the best. There are many benefits that a weight lifter can enjoy when having a good quality power rack available to them. With weight lifting providing better results than machines, having a good power rack is critical if you want to get the most from your workouts. We have listed here some of the more well-known benefits that lifters enjoy when using a power rack for their workouts. Easier to Use – Power racks are excellent for performing squats correctly and safely. If you have ever done squats without a rack you know how clumsy and difficult it can be to get the bar up onto your shoulders – especially if you are also using plates. A power rack allows you to load up the bar with whatever amount of weight you want. Then you can just position yourself correctly underneath the bar that is now on the rack and easily lift it onto your shoulders. It is also easier to safely get the bar off your shoulders when you are done. They Promote Safe Workout – Power racks are equipped with lateral pins that catch your bar if it starts to slip of fall. It allows lifters to work out alone safely. Working out by yourself can be dangerous, especially if you are lifting heavy weights. With the power rack, you will be able to perform many different exercises without the worry of working out alone. Versatile – If you want a piece of equipment that can help you safely and correctly do dips, chin ups, bench press, squats, pull ups and more, you have found it in the power rack. When you are researching different power racks on the market, there are a few things you want to look for in the models you are considering. We have listed these points below to make your research and shopping much easier. Sturdiness – Look for power racks that are made with all steel construction and super strong welds. The uprights should be sturdy; double-gusseted is even better for maximum stability and durability. Look for a load capacity of at least 500 pounds for a home gym. You don’t want the rack to be too light or it will feel unstable. Uprights – The uprights on your power rack need to be adjustable so they can be set to your specific height. You don’t want to be trying to do overhead presses and have the rack be in the way. Size – Look for a power rack that is tall enough to overhead press and wide enough to perform sumo squats and other types of squats without bumping the sides. Pull up/Chin up Bar – For additional exercises look for a power rack that has a straight bar across the top that can be used for a multitude of exercises from chin ups to leg raises. Safety Pins – These pins are what are responsible for being able to do different exercises at different heights. You will want to consider the following points when you are looking for the right power rack for your home. How much space do you have for the rack? – Not only do you need to consider how much floor space you have available you need to look at your ceiling height where you are putting the power rack. You will also need to consider the space around the rack and make sure it can accommodate the bar and other equipment. If you are choosing a power rack with a pull-up bar, make sure there is plenty of head clearance for you to exercise safely without smacking your head against the ceiling. What accessories does the rack have? – Some models have a few simple features and others are feature rich with tons of add ons. Decide what accessories you want before you begin your search so you can eliminate any that don’t meet your requirements. How tall is the rack? – Look at the height of the power rack and compare it to your own height. If you are very tall, you need to purchase a rack that will accommodate that. On the flip side, if you are short, don’t purchase a rack where the pull up bar is 8 feet off the ground. In most cases, very cheap racks tend to be shorter and narrower so spend the extra money for one that is the proper height for you. Anchoring Ability – Most power racks are meant to be anchored to the foundation or to a lifting platform. The ability to anchor them provides more stability to the rack. If you don’t want to anchor your rack directly to the floor, consider a lifting platform that can go underneath it. Anchoring the power rack will give you much needed stability, especially when lifting large amounts of weight or doing pull ups. Easy to Use and Adjustable – Look for power racks that are easy to adjust quickly. When you have to stop your workout and struggle with pins it affects the quality of your workout. Make sure that the model you choose can make fast and easy adjustments. Avoid Stabilizers – Stabilizer bars can be found on some models of power racks. They run across the bottom, backside of the rack and are used to stabilize the rack when anchoring is not done. The problem with these bars is that they get in the way of benches and also obstruct your feet. If the rack has a stabilizer, make sure it is removable or flush with the ground. There are several extras that you may want to consider when you are comparing power racks. We have listed these optional features below. Dip bar – Dip bars usually attach to the pins and protrude from the back of the power rack. They don’t come out any further than a loaded barbell would. Depending on the model, the dip bar may attach in the front. 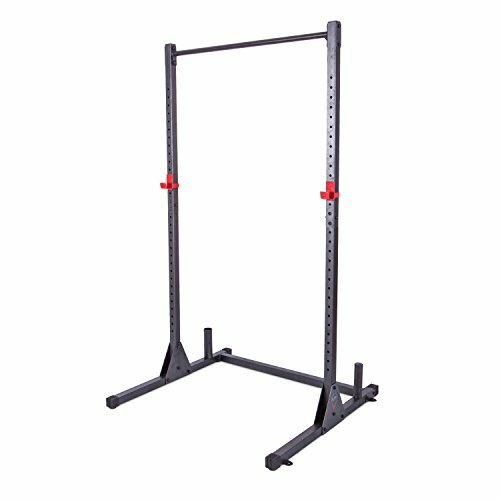 Step up platform – This is a great added accessory for your power rack that can be beneficial during your workouts. Storage Hooks for Barbells – If you routinely use different bars during your workouts, you may find extra storage hooks very useful. They usually fit on the outside of the rack toward the rear. Storage Hooks for Bands or Chains – These hooks are on the sides of the rack and face out. They are perfect for storing bands when you are not using them. Lat Pulldown – This add-on is great for back work but be aware that it will take away some of the depth of your rack. We hope this guide provides you with the information you need to better understand power racks and to help you be aware of features that are available on different models. The purpose of our guide is to give you a much clearer idea of what will be the best choice for your specific space, needs, and budget. There are a lot of power racks on the market so you should take time to research different models before purchasing. Power racks are an excellent addition to any workout routine and are easier than ever to get into your home gym, giving you all the flexibility and options you would have in a professional gym. The main thing you can now be confident in when shopping is that you can choose a power rack that will last a long time, that will provide the stability and durability you want, and that will be safe to use.